Timbers At The Pinery - Too many upgrades to mention. Must see to appreciate! MLS#2880867. RE/MAX Professionals. Parker schools, but Elbert county taxes. Close to town & DIA. MLS#8243538. Osgood Team Real Estate. Windy Hills - 10 min drive to Super Target, Kohl's, and Super Walmart, grocery etc. MLS#3488501. Equity Colorado. Horse Creek - There are also two large bedrooms with walk in closets, and a full bathroom in the basement. MLS#4915892. Premier Properties. Basement is finished with stained concrete floors, just needs a bathroom and bedroom added. Speaker system in home. MLS#7374923. RE/MAX Alliance. Great location, with quick access to trails, and close proximity to schools! MLS#5900112. Atlas Real Estate Group. Olde Town Parker - Easy access to I-25 through Hess or Ridgegate. Priced to sell quickly! MLS#7814597. Your Castle Realty LLC. Regency - Easy access to I25, light rail and Park Meadows amenities! MLS#8504025. LIV Sotheby's International Realty. Stonegate Knolls - Convenient access to I25 & C470. Do not miss! MLS#4627480. RE/MAX Masters Millennium. Large, lush backyard with patio for grilling and great landscaping. Some furniture is negotiable. MLS#3562562. BTT Real Estate. 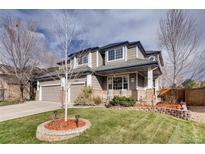 Great Location, walk to school and pool, easy access to 470 and I-25 MLS#2921861. BTT Real Estate. Villages Of Parker - Dual zone heating and air for efficiency and unfinished basement with room to expand. MLS#1691198. RE/MAX Professionals. Parker Hylands - Stainless steel kitchen appliances and washer/dryer. MLS#8018458. HomeSmart Cherry Creek. Pinery Southwest - This house has too many updates to list! MLS#1825910. Redefy. Villages Of Parker - This gem won't last long, book your showing today! MLS#8930295. Redefy. Pinery Southwest - Quick trips to restaurants and shopping in Parker and Castle Rock. MLS#4894683. LT REAL ESTATE LLC. Stonegate Knolls - Enjoy the low maintenance, beautifully landscaped yard from the covered patio. MLS#3026305. Freedle and Associates LLC. Country Meadows - To top it all off, the large shaded yard backs to open space and the Cherry Creek trail for convenient access to Cherry Creek state park. MLS#3775770. BlueMatch. Country Meadows - Open house Sat April 20 from 11-2 pm. Make this home yours today! MLS#5187744. Keller Williams Advantage Realty LLC. Timbers At The Pinery - Tons of storage or enough room to add a dedicated media room. MLS#3410841. RE/MAX Alliance. NEWER ITEMS 50 yr shingle roof, ext/int paint, high efficient furnace, 2 hot water heaters, water softener, carriage garage doors with new openers MLS#9808629. RE/MAX ALLIANCE. This home is a must see, don't miss out! MLS#9295324. REALPRO REAL ESTATE PROFESSIONALS.